Tony Palladino (left) made a welcome return with the ball for the Derbyshire attack, with a four wicket salvo against an experienced Somerset batting line-up and finished a rain affected day with 4-61, his best bowling of the season to date. After a mixed bag of a day yesterday performance-wise, Derbyshire would like to have made an early breakthrough, and post a thirty-four minute rain break, that's exactly what they did. Nick Compton, who is under severe scrutiny for his England place in the Ashes, scrapped and scratched his way to an unconvincing 15 from 50 balls before edging to first slip from a length ball by Tony Palladino. Marcus Trescothick - who was dropped by Richard Johnson trying to flick the ball over the slips (it would have been a wonderful catch) - batted at times beautifully, but cautiously and brought up his 50 in the 34th over from 110 balls. No sooner had the former England opener reached his half-century then he pushed at a Tim Groenewald delivery and edged to third slip. Dean Elgar followed soon after, caught driving to Madsen in the covers from Palladino. How Derbyshire had missed Palladino when he took the wickets of Craig Kieswetter and James Hildrith. The England wicket-keeper Kieswetter edged behind to Richard Johnson and Hildrith was plumb LBW for 36. 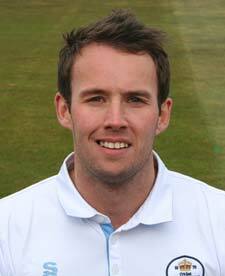 Tim Groenewald returned to have Alex Barrow caught behind by Johnson to leave Somerset 166-6 at Tea. Play was stopped on three occasions during the day, the more serious one was just before tea and with play due to start at 5pm, the rain came again and a delay occurred. Peter Trego was given a life when Chesney Hughes dropped him at 2nd slip off Palladino. The drop was proved to be a little on the annoying side as Trego then proceeded to edge and drive Palladino for three fours in the same over. More rain arrived after three overs following resumption, which signalled the close of play with Somerset on 180-6. Play will start tomorrow at 11am, with the game perfectly poised.